The Upper Severn study considers methods of flood-risk management by riparian land-use in rural ‘piedmont’ floodplains where overbank flows are significant, where terrain can accommodate incremental increases in storage, and where value at risk can be protected by the engineering of longer duration peaks at lower ‘stage’ (water surface) levels. A tenet of the work is that sustainable stout hedges in the path of floodwater form shallow weirs. It is visualized (pragmatically defined) that dense stiff vegetation which creates a functional weir of approximately 0.1m – 0.2 m head will demand a width on the ground of between 1 m and 3 m (depending on local conditions). Figure 1: Typical flood plain field boundary developed as corridor of high hydraulic friction. Such development complements environmental functions of pollution control, wildlife benefit, etc. (Top left insert is 3D Lidar scan at same location typical of the elevation data resampled and developed for the project). Grid location 324600, 308500, 65aod. The approach therefore is that engineered riparian vegetation (i.e. multiple farmed hedgerows) can attenuate floods which would otherwise exceed downstream thresholds of loss and that such attenuation can be achieved with minimal lateral impact. The complementary function of such vegetation – hydraulic ‘agri-structure’ – alongside FRM infrastructure is explored. The main physical aim of the study is to quantify and compare the storage capacity of a typical rural floodplain as its terrain roughness is increased and thereafter to quantify resulting downstream attenuation. The main human aim is to enable communication of potential benefit in real time to inform riparian landowners and managers. There is acknowledgement that, in some areas, the physical and human aspects of the research make uncomfortable bedfellows. Figure 2: Threads and themes of the project. 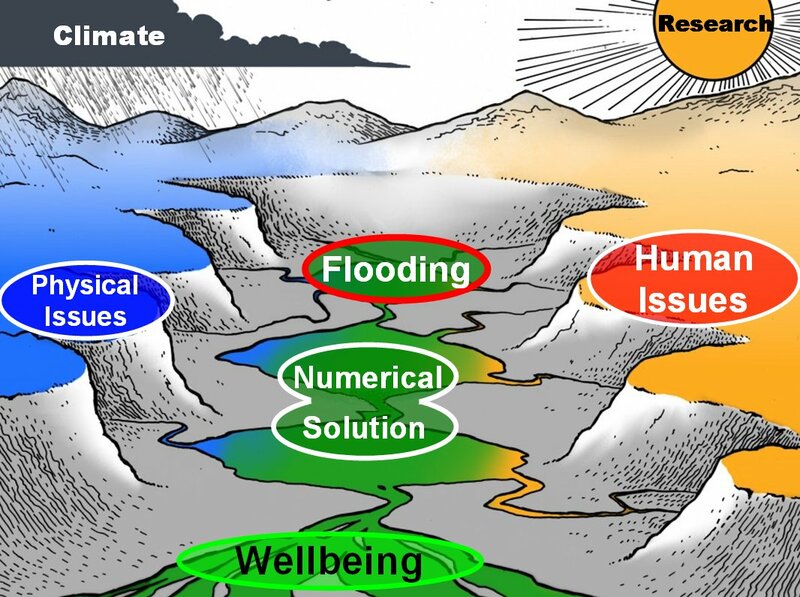 Water levels within a valley are influenced by a diverse array of physical and human factors which, combined with the necessary numerical analysis, present professionals and land owners with beneficial solutions to recurring loss, insurance blight and the promotion of wellbeing within their communities. Issues of riparian rights and agricultural cross-compliance are linked in the approach, as is a notion of competition between solution by attenuation and solution by resilience. Figure 3: The Study Site south-west of the Severn-Vyrnwy confluence. A is Abermule. R is Rhydesgyn. The yellow ‘callouts’ highlight areas of project potential. Embedded in the project is the theme of a ‘productive’ approach, i.e. one that presents an achievable solution and broadcasts immediate, practical demonstration of results. Success is important as it could significantly reduce economic blight and restore wellbeing to communities under threat of increasing risk, not only in immediate rural areas, but also at urban sites downstream. A range of experimental 2D inundation models are developed methodically to test the performance of the 10km Munlyn–Buttington sub-reach of the study site. First, a low resolution model of some 5000 irregular elements (c. 3 nodes/hectare) is calibrated dynamically against the real (October 1998) hydrograph of a 100 cumecs bank-full event. This experiment is indicative of useful boundary and channel conditions for the coupling of intermediate length reaches. Then, higher resolution models (c. 37 nodes/hectare) are run to yield effective comparison of flow over terrain as hydraulic friction is increased at watercourse boundaries. The approach yields interesting results. 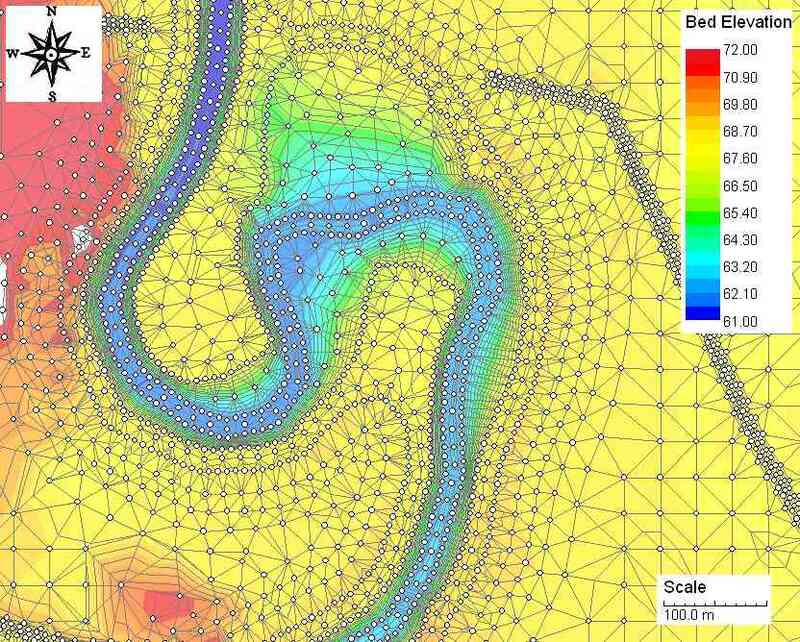 When dense porous structures at well sited field boundaries are modelled in software, flood storage capacity of the Upper Severn is shown to increase by over 20% with only minor effect on the wet perimeter of the flood plain. The research goal of validating this gain by numerical analysis is presented. Other virtual field tests suggest that representation of hydraulic friction by a combination of form and roughness is numerically viable. The broader aim of stimulating attenuation research into hydraulically productive land-use is shown to be achievable which, in turn, suggests that such management would be as sustainable as routine cross-compliance, and as economical as routine biomass production. Figure 5:. Element density is managed by buffering and spacing nodes along terrain feature lines. Figure 6:. This novel technique of node distribution forms the basis of resampling Lidar elevation datasets into a CFD mesh. Key to productive calibration of real hydrographs over such high-friction designer floodplains is the optimized coarseness of the array of nodes assembled to represent irregular rural features. Based on the current study, a terrain point-cloud can be degraded below the relatively unproductive 37 nodes per hectare, provided that strategic points remain anchored to vector break-lines at land-parcel polygonal (ie field) boundaries. 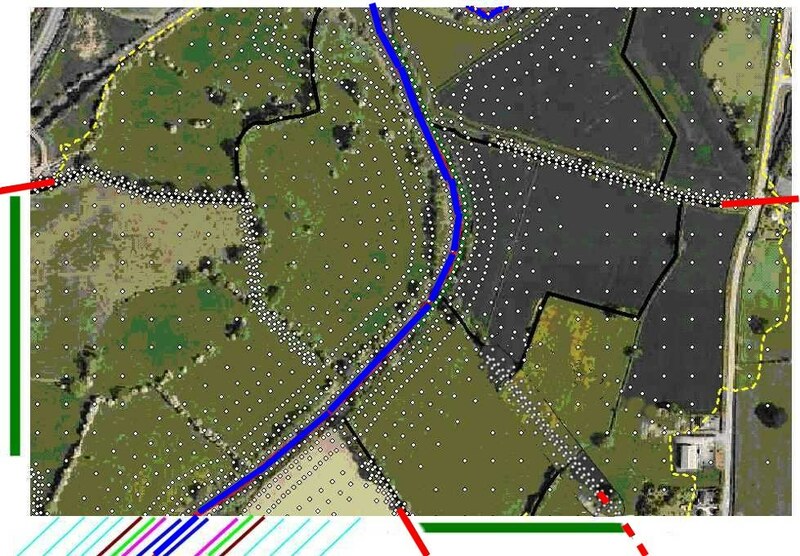 It is estimated that, using current technology, an average point budget of approximately 10-12 nodes/hectare will allow credible dynamic 2D analysis of floodplain performance. The coupling of sub-reach models hydraulically demonstrates the potential of 2D techniques for the evaluation of floodplains large enough to deliver significant downstream gain. Confidence in such a coupled hydraulic model is enhanced by mid-reach calibration, in turn enabling on-line streaming of downstream forecasts. A method of increasing flow across the riparian connection between channel and floodplain is tested and results indicate that the capacity of the flood plain responds beneficially to increased bank roughness at critical points. The objective of stakeholder participation is considered in respect of model choice as well as element distribution. This human issue is shown to be broadly compatible with the wider research goal. The value of a modelling study lies in its accuracy, sensitivity and credibility. By selecting a 2D (more finely distributed) rather than a 1D (more coarsely ‘lumped’) method, confidence is assigned to homogenous CFD equations relying on objective spatial parameter values rather than heterogeneous bespoke weir equations of notional flow across subjective cell boundaries. Furthermore, element distribution in a 2D model is capable of development ever closer to reality. Unsurprisingly, there is a trade-off between the main physical and human objectives of the study. Within the aim of promoting wellbeing by scientific method credible to stakeholders lies the issue of communication. Since 2010,UKfactual stage data has been streamed from many river gauges, but the streaming of a predictive model alongside such data may need to approach real-time to sustain the attention of an audience of stakeholders who monitor the stage hydrographs of flood events. The study suggests that this is achievable by an optimized combination of the CFD model’s irregular mesh and computer capacity. Whilst the CFD meshes adopted indeed represent the terrain of the study site, they are not yet optimal. Node distributions selected for the above field tests range from ‘effective-but-coarse’ to ‘fine-but-unproductive’. 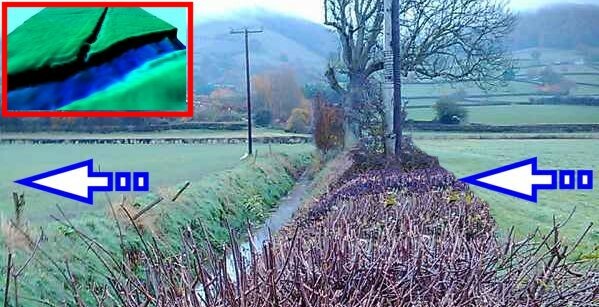 The study indicates that, for future research and between these two extremes, there lies a point-cloud capable of yielding a computational mesh pegged to irregular terrain features, standard for all researchers, credible to (and editable by) stakeholders and efficient for streamed communication. It is suggested that, provided such standardization is authoritative, it would be productive in terms not only of research time but also of the quality of river basin management. Thus it is demonstrated that riparian land use can make significant contribution to flood exceedance attenuation and that open source 2D predictive modelling is fit for such purpose. 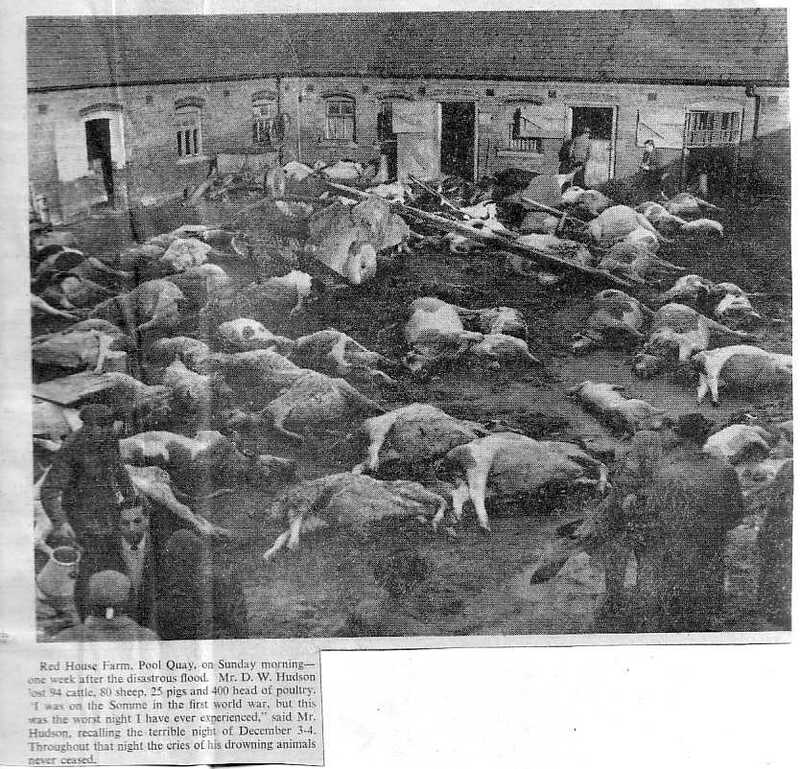 Pragmatic agricultural research (of hydraulically robust biomass structures) now has to match modelled vegetative structures with decadal lifespan to match decadal exceedance return periods.